Lisa works in Black and Sons and Alice works in Black and Sons, too. Lisa works in the Accounts Department but she wants to work in the Marketing Department with Alice. Alice works in the Marketing Department. They are going to go to Greece. They are on holidays next week. Lisa and Alice go to the Post Office to get the passport but Lisa hasn’t got any photos. They aren’t in her bag. She goes to the Bus Station, to the photo booth. Lisa goes into the photo booth and she takes some photos. Next she goes outside of the photo booth and she waits for her photos. Her photos will come out of a slot of the machine. Lisa takes them, but in the photos there is a man. In the first photo the man has got a cruel smile. In the second photo the man is looking to the right. In the next photo someone is holding the man’s scarf. There isn’t any man in the fourth photo. There are only two hands. In one hand there is a ring. It is a snake ring. In the other hand there is a tattoo. It is a blue bird tattoo. The man is dead. Who is the murderer? Lisa and Alice are at the police station. Lisa is telling her story to the police. She is showing the photos. The detective is very interested. She has got a plan. - The murderer will go back to the photo booth. He will want to have his photos. - He will look for you. You can help us, Lisa. 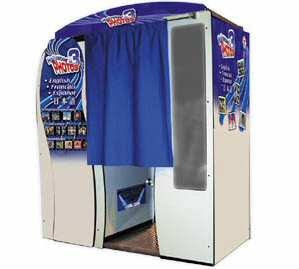 She goes back to the bus Station, a man is standing by the photo booth. He is young. Lisa looks at his hands. Lisa sees the snake ring and the blue bird tattoo. The police catch the murderer. Lisa is safe. Hello, I’m Xavi, I’m 13 years old and I’m your new pen friend. I’m a student of I.E.S. Sabadell in Sabadell. My hobbies are football and formula one. I’m good at football and maths. I’m bad at music. I’m interested in science. I’m going to explain my typical day. I wake up at 7:50 a.m.: I have breakfast. I go to school at 8:30 a.m. and I have lunch at 13:30. I go to school again at 15:30 and at 18:30 I only train on Tuesdays and on Thursdays. I do my homework and I have dinner at 13:00. I go to bed at 00:00. That’s my typical day. My mother is 43 years old. Her name is Antonia. My father is 45 years old. His name is Pedro. My sister is 18 years old. Her name is Marta. My grandfathers and grandmother are 73, 70 and 78 years old. Their names are Jose, Juana and Ramon. My other grandmother is dead. I’ve got a pet. It’s a dog. Its name is Flufly. It can run and swim but it can’t fly. It’s very beautiful. It’s a Yorkshire. Today in Can Rull, it’s cold and light rain shower but it isn’t sunny and foggy. It’s cool and windy. Yesterday, it was cold and cloudy. I would like to go to the beach and to go to the swimming pool on these holidays. I don’t want to do my homework on these holidays like the last holidays. My house is normal. There’s a living room, a kitchen, a bathroom and three bedrooms. My bedroom is normal: there’s a bed, a computer, a wardrobe, a window and two shelves. It’s beautiful for me. Hello. My name is Carlos and today is my birthday. Now, I’m 14 years old. How old are you? I’m not very tall but I’m not fat, either. I’m a good worker because I help at home and I do my homework at school or I practice a sport. This is my typical day: First I usually wake up at seven o’clock. I always have breakfast and then I brush my teeth. Then, I go to school. Next, we have two hours of class and a break. It is about 30 minutes break. After the break we go back to class and we have three lessons more on Mondays, Wednesdays and Fridays or two lessons on Tuesdays and Thursdays. Then I go back home and I have lunch. In the afternoon I have two lessons more but on Wednesdays and Fridays we haven’t got afternoon lessons. My favourite subjects are science, maths and physical education. On Saturdays we don’t go to school. I do my homework and after that I usually go to play soccer with my team CAN RULL ROMULO TRONCHONI. Do you play any sport? Baseball, rugby, hockey, soccer … Last Saturday I played with my team and I scored a goal!!! I’m not very good at football but I’m interested in it. It is my passion. I’ve got a lot of friends. My best friends are You, Jordan, Eric, Xavi, Christian… I surf on internet with them or I play with my console. Finally I have dinner at 10 o’clock, it is a light dinner. After that I watch T.V. My favourite programmes are quiz shows and cartoons. I love music, punk and rock music. My favourite groups are Satanic Surfers, Blink 182, Lag Wagons…. They are the best!!! You can watch them in www.youtube.com. I’m a boy and I’m 14 years old. I am tall and thin. I have got brown and short hair. I have got brown eyes, too. My mouth is a little big. I live with my parents and my brother in our house. My mother is short. She isn’t blonde but she has got brown straight hair. She is 38 years old. My father isn’t tall. He is short and he has got a very short hair. He is 44 years old. My brother isn’t tall and he has got short hair. He is 9 years old. I had a bird but he died. He could fly and he was singing all day. He couldn’t swim and play the piano. My house is big. It has got a big kitchen where we have our meals. My house also has got four bedrooms and two bathrooms. There is a sitting room with a television. What is your favourite food? My favourite food is meat with potatoes. I don’t like vegetables and I hate lentils. 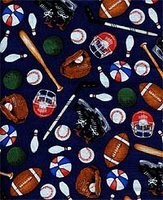 My hobby is sports. I’m interested in football and basketball. I’m good at football and I’m good at handball, too. My school is IES Sabadell. It is big and now it is new. We have had works of remodelling in our school for two years. Now, they are finishing works. We mustn’t eat or drink during the lessons. My school starts at half past eight and it finishes at half past five. This is my typical day. I wake up at half past seven (except on Sundays). I have milk and biscuits for breakfast. Then, I go to school. I always have lunch at home. After I go back to school for my afternoon lessons. I often go out of school at ten minutes to five and I go to Barcelona by train to do my football training. I usually arrive at home at ten o’clock. We often have dinner at ten past ten. After dinner I do my homework and I go to sleep. Next holidays I will go to Italy. We must play a football match in a competition but it is not quite sure. Hello, my name is Nuria. I’m thirteen years old. I’m from Catalonia. I am a student but I don’t like studying. My favourite class is Art. I like sports. My favourite sports are water polo and swimming but I don’t like golf and boxing. I often go to the swimming pool with my friends. I don’t like making beds in my house but I help to my mother. My mother always says, “You should make beds”. My favourite household job is cooking. 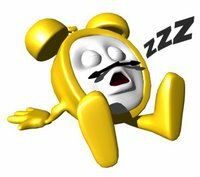 My typical day is: I normally wake up at half past seven. I have milk but I haven’t biscuits for breakfast. Next I go to my school on foot. My school starts at half past eight every day but it finishes at noon at one or two o’clock depending on the day. Later I have lunch at home. Some afternoons I go back to school at half past three and the lessons finish at half past five. My father’s name is Pedro and he is 49 years old. My mother is 46 years old. I have got a brother and a dog. I sometimes watch TV but I’m always surfing in internet with my computer. I love my computer and my mobile. I like listening to music. I’m wearing glasses from the nine of October, 2006. It is my birthday. My favourite countries are Mexico, USA, Canada and Luxemburg but Italy, Great Britain, and France are not my favourite countries. Last holidays I went to Disney world Paris Resort. I would like to be a biologist I like very much or I would like to be a vet but I wouldn’t like to be a nurse or a hairdresser. Well, this is my world. Tell me about your world. Gloria is a hippopotamus. She is Afro-American and she is nine years old. 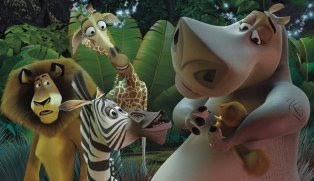 She was born in Central Park Zoo and her friends are Alex, Marty and Melman. She isn’t very fat but she is a beautiful hippo girl. She isn’t very tall but she is smart. Her personality is friendly and independent. She is a “tough chick” hippo girl and energetic. She is a mothering type and the voice of the reason. Her hobbies are swimming and dancing. She is good at swimming and dancing but she isn’t good at running. She is interested in helping friends but she isn’t interested in Madagascar. Gloria is a hippopotamus but she isn’t a giraffe. She was born in Central Park Zoo and she is not the Zoo star. She is nine years old and she is Afro American. She is not tall and fat. She is a “tough chick” girl and beautiful. She is smart, friendly and energetic. Her personality is independent and she is the voice of reason. Her hobbies are swimming and dancing and she is good at mothering. She isn’t interested in Madagascar and sports. She is not good at running but she is interested in swimming. 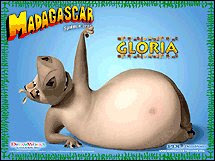 Gloria is a hippopotamus but she isn’t a lion. She is not the star of the Zoo. She was born in Central Park Zoo. She is nine years old and she is Afro American. She is not fat and tall. She is beautiful. She is smart and friendly. Her personality is energetic and funny. She is a “tough chick” girl and she is the voice of reason. Her hobbies are swimming and dancing. She is interested in mothering but she isn’t interested in Madagascar. She is not good at running but she is good at swimming. Next thursday, we are going to "Firenze" . It's our holiday's trip this year. I say "our" because my wife and children with my sister in law niece and nephew are coming with me. We'll fly to Peterolo airport from Barcelona at midday. I hope the weather will be fine. The weather forecast tells hot and warmy days in Florence. 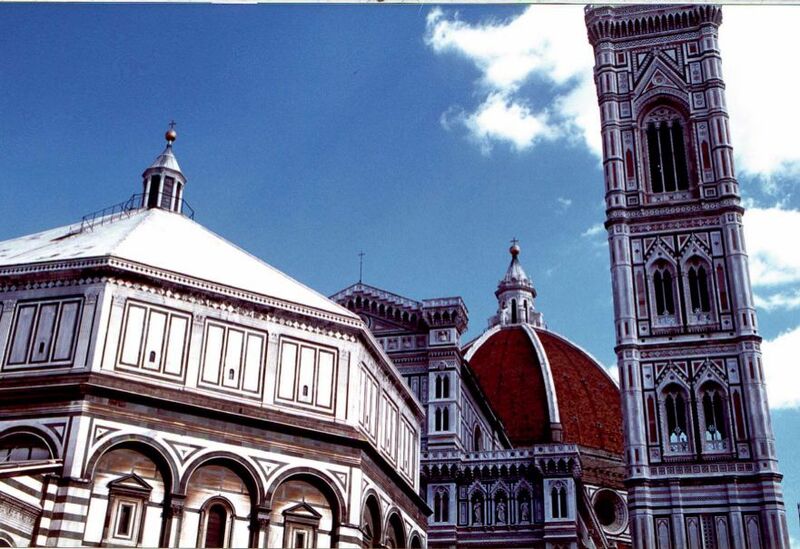 Florence is the capital of Toscany, one of the richest regions in Italy. Our hotel is "Hotel Diplomat" next to the railway station, that's to say in the city center. It is a dragon. It hasn't got legs and arms. It has got a long tail and a big mouth with sharp teeth. It has got two horns. It hasn't got flips. The dragon lives in a cave with fire. Its colour is red, black and in some parts orange and yellow. It can fly but it can't jump and walk. It has got big wings. It is very a big mystic animal. It hasn't got claws. It has got two eyes and two ears. Under the ears it has got hair. It eats meat, fish and fruit. It has got an enormous memory. It remembers the name of any boy and girl who don't read books. It isn't an insect. It's a reptile. It lives in forests, grasslands, caves, jungles. It lives everywhere. It hasn't got hands or legs and it is very long. It has got a big mouth but it has got small eyes. It can't fly and it can swim. It hasn't got horns but it has got two long teeth. It can't jump. It eats mice, rats and small birds. It has got different and beautiful colours: red, whit, black, green... What is it? It isn't a bird. It is a mammal. It can swim and walk but it can't fly and talk. It lives in Africa. It lives in rivers and lakes. It eats vegetables and sometimes fruits. It's a very good swimmer but it is a very bad runner. It has got a short tail and it is very fat. Its mouth is enormous. At the top of its head there are two small and round ears. Its colour is grey. What is it? It's a mammal. It lives in the oceans. It's an aquatic animal. It eats small fish. It's very big. Its colour is blue. It has got two small eyes and an enormous tail. It hasn't got flips. It can swim very fast. It can't fly but it can jump in the water. It isn't a fish. What is it? It's a mammal. It isn't a reptile. It lives in mountains and caves. It eats fish, meat and fruit. It is very big. It is brown. It has got small eyes and a short tail. It has got a bit nose and a sharp teeth. It can't fly but it can run very fast. It is a good walker. It can swim but not very well. It is a good fisher. What is it? Bertie is a young man. He lives in Spain but he is English. He comes to Spain looking for Rosa. She was in London last summer and Bertie met her and he felt in love. Bertie is a teacher of English. Bertie always dreams. He is a great dreamer. In one of his dreams, he says to his mum "I am going to marry Rosa". Bertie's mother comes to Spain because she is bosy and she wants to prepare her son's wedding. But Bertie doesn't know where Rosa lives. Jose is Bertie's "portero". He helps Bertie dressing himself up as Rosa but Bertie's mum isn't stupid. In that moment, Bertie finds to real Rosa. She is a waitress in a flamenco pub. 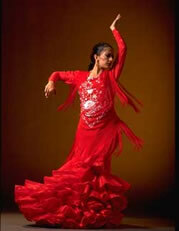 She wants to be a professional flamenco dancer and singer. Bertie asks her " Do you want to marry me?" but Rosa says "no". Jose meets Mrs. Britt and he falls in love with her. Mrs. Britt meets Jose and she falls in love with him. They want to marry. They say to Bertie "we are going to marry". Rosa is very happy but Bertie doesn't like the idea. At the end, Bertie accepts the wedding. I listen to the alarm clock at seven o'clock. I wake up and I get up at half past seven. Then I go to the toilet and I have a shower. After that I go to the kitchen and I say "good morning" to my mum and I kiss her. I have breakfast. I eat some biscuits and I drink a glass of milk. Next I go to the bathroom and I brush my teeth. Then I make my bed and I tidy my room. I also dress up and I prepare my schoolbag. I say "goodbye" and I go to school with my friends. We walk on foot and we talk about school, sports, music... Finally we arrive to the classroom and the lessons start. It's twenty five past eight. After saying "good morning" to everybody, I go to my chair and my table. I sit on my chair and I prepare my material. After that I listen to the teacher and I correct the exercises. When the lesson finishes I talk with my partners. Then another lesson starts because the teacher is in class and it is the history lesson, we open our books and notebooks and we do what the teacher says. It's time to go to the playground. I love going to the playground. I usually stay in the playground with my friends. I have my snack and I drink a juice. After that I have a Catalan lesson and a free Credit. My free Credit is Physical Education. I love P.E. Finally, the lessons finish and I go back home on foot with my friends. We talk and laugh all the way. When I arrive at home after the school lessons at noon I say "hello" to my mum and I kiss her. I go to my room and I do my homework. My mother says "we are going to have lunch". I go to the kitchen. I eat with my mother and my sister, too. I help to my mother to clear the table. Then I prepare my schoolbag. I go to the diningroom and I put on my anorak. I look at my watch, " it's late!" I say "goodbye" and I go to school on foot. When I arrive to the school, I go into my class and I say "good afternoon" to everybody. Then I sit down. I take out my books and I listen to my teacher of English. When the lesson ends, I stand up and I talk with my friends while next teacher comes. After the lesson at half past five I go back home on foot, again. I enter to my house and I say "hello!". I take off my anorak. I go to my room and I leave my schoolbag on my bed. Finally I go to the kitchen. I take my snack and then I eat it. After having a snack and watching TV. I do my homework for next days . I do it listening to music. When I finish my homework, I usually have a shower. Then I read a book. I like reading books. I sometimes draw a picture or I chat with my friends in internet. I normally use the messenger. Later I go to the bathroom and I wash my hands. I help to my mother. I prepare the dinner with her. I lay the table and then we have dinner. My favourite food is chicken and chips. Later, I go to the bathroom and I brush my teeth. Then I go to the sitting room and I watch TV with my family. Finally I say "good night" to my parents, I kiss them and I go to sleep. Hello! How are you! My name is _ _ _ _ _ _ _ _ . I'm thirteen years old. My eyes are blue. My hair is long curly and blonde. I am not wearing glasses. My family is big and I love them. My father's name is Francisco and my mother's Maria Angeles. I have got only abrother, his name is Frank. I have got three pets, a dog, his name is Kiva. She is very small and beautiful. A tortoise, his name is Tor and a fish. It is a goldfish and his name is Nemo. I am a student and I go to a secondary school. It is a very big building. My favourite subjects are History, Technology and arts. I don't mind studying English, Science, Catalan and Castillian. I love Physical Education. Some teachers are nice. All my friends are very nice. I don't mind going to school. I spend a lovely time with my friends. My hobbies are listening to music and studying Chinese. I like watching TV with my family but sometimes we have problems with the remote control because I hate watching football on TV. I love pop music and I don't like staying in bed I prefer riding a bike or doing anything. I love writing. Do you like writing? Do you want to be my penfriend? My name is _ _ _ _ _ _ _ _ _ _ . I'm thirteen years old. I'm tall and thin. I always wear trainers. I live in a block house with my family. My father's name is Juan. My mother's name is Nuria and my sister's name is Fanny. I stay a lot of time in my bedroom. This is my bedroom. In front of the door there is a window. Under the window there is a bed. Near the bed there is a computer and in front of the computer there is a cupboard. Now I'm in a secondary school, it is very big. My favourite school subjects are Geography and Physical Education. When the school finishes at half past five I go to play with my friends to the park. We talk about school and friends. We spend a lovely time all together. Everyday I do my homework. On Mondays, Wednesdays and Fridays I play football with my team. This is one of my hobbies but I have got other hobbies, they are reading books, going to the cinema on Saturdays with my friends and listening to music in my grandparents house. I like all kind of music but my favourite music is pop music. My favourite food is spaghetti but I like pizzas, too. When I finish my homework I love having a rest on the sofa. I hate going to bed early. My name is _ _ _ _ . I'm 13 years old. I'm tall and thin. My hair is black. My eyes are brown. Here is a typical day in my life. I always wake up at 7:00 o'clock except on Saturdays and Sundays. On this days I wake up and get up at 9:00 o'clock. My school starts at half past eight in the morning and finishes at half past five in the afternoon. I don't mind listening to the teachers. I like playing football and I love playing basketball. I hate listening songs but I love listening to songs. I like watching "The Simpsons" . I don't like studying. I hate shopping. I haven't got any pets. My favourite pet is a dog. I want to have a hamster, too. My house is little but it is nice. I have a big family. I love them. My favourite film is "Torrente 2". My favourite colour is yellow. My favourite food is spaghetti. After the lessons in the afternoon I surf in the internet. Then I go home and I do my homework. When I finish my work I play with my console PS2. I want to be a lawyer. Well, this is my normal day. Do you want to be my penfriend? Laura and Richard like playing sports in the morning. 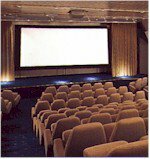 They love going to the cinema on Sundays and on Tuesdays. He loves staying in bed during the week but she doesn't like staying in bed because she prefers going to school with her friends. They don't like studying at home. Richard hates going to the disco because he likes playing basketball with his friends. Laura loves going to the disco in the evenings. They don't mind riding a bike at the weekend. Richard loves watching T.V. on Sundays night but he doesn't like listening to music in bed. She loves listening to music everywhere. Marta and I love playing sports. I don't like going to the cinema but she likes going to the cinema. I don't love staying in bed and she doesn't mind staying in bed. We hate studying at home. We don't mind going to the disco. We love riding a bike. I hate watching T.V. but she likes watching it. We don't hate listening to music. Anna and Eric like playing sports but he doesn't like going to the cinema and she loves going to the cinema. They don't love staying in bed but they don't mind studying at home. Eric hates going to the disco but Anna likes going to the disco. They love riding a bike. He loves watching T.V. but she hates watching it. They don't mind listening to music. 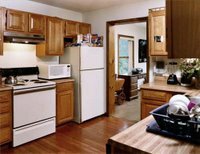 Is there a bath in your kitchen? No, there isn't a bath in my kitchen. Are there armchairs in your livingroom? Yes, there are armchairs in my livingroom. Is there a towell in your bathroom? Yes, there is a towel in my bathroom. Are there two beds in your bedroom? Yes, there are two beds in my bedroom. Is there a wardrobe in your diningroom? No, there isn't a wardrobe in my diningroom. Are there three bikes in your garage? No, there aren't three bikes in my garage. Is there a tree in your garden? Yes, there is a tree in my garden. In this picture I can see a class. The sun is shining. It’s two minutes to ten. It is October. There is a teacher. She wears a purple jacket and a white t-shirt. She wears glasses, too. She is sitting and writing on a paper and the students are reading, but a boy is writing on the blackboard. He is wearing blue jeans and a blue sweater. And a girl is playing with a video game console. She is wearing a pink skirt with a green sweater. The children are studying with the door closed. In the classroom there is a map of Europe and a picture of an old man’s face. There is a big and green plant next to de door and under the calendar. Noa, 13 years. 130 words. This is Peter’s class. In his class we can see a teacher and children. The weather is sunny but it isn’t foggy or thundery. Peter is in front of the blackboard. He is wearing a yellow shirt, a blue sweater, blue jeans and brown shoes. Above the board there is a photograph. He is the headmaster of the school. The teacher is called Susan. She is sitting and she is correcting the exams of English. She is wearing a purple jacket and a white t-shirt. The class is in silence. The students are working hard. Alice is looking at the clock. It is ten o’clock, at half past ten the bell rings. Alice has a brown hair and brown eyes. She’s wearing a green sweater and she is doing her homework of maths. Far from Alice, there is a plant. On the plant there is a calendar. Next to the calendar there is a green door with a glass on it. It is closed. Laura, 13 years. 164 words. This is Lola’s classroom. She is the teacher. She is sitting on a chair and she is writing on a paper. Next to her, there are a glass and a bottle of water. Behind Lola, there is a map of Europe. On the wall, above the map, there is a blue clock. Lola asks to the students “What time is it?” and a student answers “It’s ten o’clock.” Next to the clock there is a headmaster photo. In front of the photo there is a boy. He’s wearing a blue sweater, yellow shirt, blue trousers and brown trainers. He isn’t wearing glasses or earrings. The boy is cleaning the blackboard. Far from the teacher there is a closed door and a big plant. On the wall there is a calendar with mountains. It is October. Near the calendar there is a window. Lola says “Emma, what’s the weather like, today.” Emma says “today, it is sunny and a clear sky day, but it isn’t rainy and mist.” The students are listening to Lola and Emma. Eric, 13 anys. 175 words. SOCIETIES NEED RULES TO GO ON. WE SHOULD FOLLOW THESE RULES BECAUSE WE LIVE IN SOCIETY. YOU MUSTN’T THROW PAPERS ON THE FLOOR. YOU MUSTN’T CHEW GUM IN CLASS. YOU MUST KNOCK THE DOOR BEFORE GOING IN. YOU MUST PUT YOUR CHAIR ON THE TABLE AT THE END OF CLASSES. YOU SHOULD LISTEN TO THE TEACHER AND PAY ATTENTION TO HIM/HER. YOU SHOULDN’T TALK WITH YOUR PARTNER IN THE LESSONS. YOU MUST RAISE YOUR HAND BEFORE SPEAKING. YOU MUSTN’T SIT ON THE RADIATORS. WE SHOULD KEEP IN ORDER OUR SCHOOL MATERIAL. WE MUSTN’T RUN AND SHOUT IN THE CORRIDORS. WE SHOULD GO TO THE LIBRARY ONCE A WEEK, AT LEAST. YOU SHOULDN’T BE UNPOLITE WITH PEOPLE. WE MUSTN’T STICK CHEWING GUMS UNDER THE TABLES OR CHAIRS. WE MUSTN’T EAT IN CLASS. WE MUSTN’T WRITE OR PAINT ON THE WALLS. YOU MUST TAKE CARE OF YOUR CLASS AND YOUR SCHOOL. WE SHOULD TURN OFF THE LIGHTS WHEN WE END THE CLASSES. WE MUST KEEP CLEAN AND IN ORDER THE BATHROOMS. WE SHOULD KEEP CLEAN THE PLAYGROUND AND WE SHOULD LOOK AFTER OUR SCHOOL. WE MUSTN’T SIT ON THE TABLES AND THROW CHALK IN CLASS. 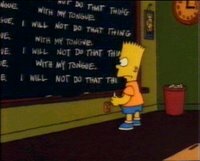 YOU MUSTN’T WHISTLE IN CLASS. YOU SHOULD RESPECT TO THE TEACHERS AND PARTNERS. WE SHOULDN’T BREAK ANY MATERIAL OF THE SCHOOL. YOU MUSTN’T CHEAT IN THE EXAMS. YOU MUST DO YOUR HOMEWORK EVERYDAY AND KEEP IT IN ORDER. WE MUST CLEAN THE BLACKBOARD. WE MUSTN’T SPIT ANYWHERE, IT IS VERY UNPOLITE. WE MUST TIDY UP OUR MATERIAL AND OUR CLASS. YOU SHOULD BE QUIET WHEN SOMEBODY IS TALKING. WE SHOULDN’T BOTHER TO THE OTHERS. YOU SHOULDN’T SLAM THE DOOR WHEN YOU ARE ANGRY. WE MUST OBEY TO THE TEACHER AND TO THE OLD PEOPLE. WE MUSTN’T SMOKE OR FIGHT. WE MUSTN’T DIRTY THE BATHROOMS. WE MUST BE CAREFUL WITH THE LABORATORY MATERIAL. WE MUST CORRECT OUR MISTAKES. WE SHOULD ASK THE KEY TO THE TEACHER IF WE WANT TO GO TO THE BATHROOM. WE MUSTN’T EAT SWEETS IN CLASS. WE MUST BE PUNCTUAL TO THE CLASSES. WE MUST USE THE PAPERBASKETS. 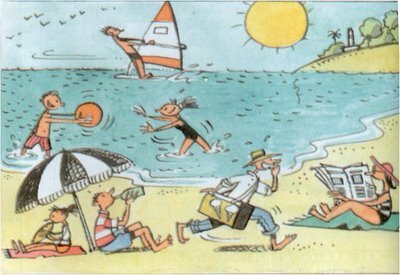 Maria’s family is on holidays in Calafell. They are on a beach. Maria is thirteen years old. Her mother’s name is Claudia. Her father’s name is Ernesto and her brother’s name is Carlos. Claudia is sitting on a towel on the sand. She is taking a sunbath. She is reading a newspaper. Ernesto is sailing in the sea. Carlos and Maria are playing in the water. They are playing with a ball. The sun is shining and it’s hot. There is a man in the beach. He is selling drinks and ice-creams. Claudia buys an ice-cream. It is a strawberry ice-cream. Next to Claudia there are a boy and a girl. The boy has got a bottle and he is drinking. The girl has got a sandwich and she is eating it. 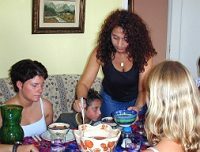 Maria’s family goes back home at the end of the day. They spend a nice day on the beach. There is a beach in the picture. There are some people in the beach. Two children are under the umbrella. They are sitting on a towel. A girl is eating a sandwich and a boy is drinking water. Near the children there is a man. He is walking and he is selling ice-creams. He is shouting “ICE- CREAMS!! !” He is wearing blue jeans and a white shirt. Near the man there is a woman. She reads a newspaper. She is on her towel. She wears sunglasses and a big hat. There are two children in the sea. They play with a ball. Far from the children there is a man. He is windsurfing. There is an island in front of the man. There are some trees and a lighthouse in the island. There are some birds in the sky. There’s a beach in the picture. The sand is yellow and the sea is blue. It’s sunny and hot. There’re a boy and a girl playing with an orange ball in the sea. There’s another boy windsurfing. There is another girl under an umbrella and she is eating a sandwich. Under the umbrella there’s a boy, too. He is drinking water. The girl who is under the umbrella is sitting on a red towel. The umbrella is black and white. There’s another man that he is selling ice-creams. He is shouting. He is wearing a hat and a blue shorts. There are trees far away and a lighthouse. A woman is sitting on a green towel and she is reading a newspaper in the beach. The sky is blue and there are a few birds. They are flying. Tintin, Captain Haddock and Snowy are in Peru. There is a ship in the sea. The ship can’t go into the port because it is infected. Doctors tell that the ship is in quarantine. There is a plague called “yellow fever”. Tintin doesn’t think that it is true. So, Tintin and Captain Haddock go into the ship to investigate. Tintin finds Professor Calculus with a bracelet “Rascac Capac”. Tintin escapes. Captain Haddock calls to Thomson and Thonson. They go to the beach and find the tracks to follow Tintin. Thomson and Thonson go to the South because of Professor’s pendulum and Captain Haddock goes to the North. Haddock finds to Tintin. Then, they take a train to go to Jauga. A carriage is unhooked and Captain Haddock jumps out of it. Tintin jumps out of it with Snowy and they fall into a river. They are safe. In Jauga, Tintin helps a boy. His name is Zorrino. Zorrino knows where Professor Calculus is. On his journey to the Temple of the Sun, they get through different adventures. A condor takes Snowy to its nest. Tintin saves Snowy. They fall into a waterfall. Behind the waterfall there is a cave. It is a way into the Temple of the Sun. They find Inca mummies. The Prince of the Incas wants to kill Tintin, Captain Haddock and Professor Calculus by The Sun, because they know the secret of the Temple. They can choose the date of their death. Tintin chooses the 16th at four o’clock. The Incas tie them but Tintin talks to the sun and there is an eclipse. The Prince thinks that the sun obeys them and he liberates them. They are safe and find Professor Calculus. He met his wife in Paris. Her name was Gala Dianaroff. He lived in Italy, then, three years later in U.S.A. and in 1948 he moved to Spain. He carried many exhibitions in America and Europe. He also made some films. He did some writings. He died in 1989. Antoni Gaudí i Cornet was from Catalonia. He was Catalan. He was born in Reus in 1852. He was an architect. In 1883 Gaudí designed “Les cases Vicens”. In 1886 “The park Güell”. And in 1874-1894 he designed “El palau Episcopal d’Astorga”. In 1891 “La casa de los Botines”. In 1918 “La sagrada Familia”. A tram run over him and he died in Barcelona in 1926. Alexander Fleming was born in Britain in 1881. He was British. His family worked as farmers. He discovered the penicillin. When he was thirteen years he left to London with his stepbrother. In 1900 Alexander enrolled in the Scottish Regiment to participate in the war of the “Boers”. He was teacher and doctor of bacteriology in Saint Mary’s hospital in London. He discovered the “Lisozima” in 1922. He was elected member of the Royal Society in 1942. He received the Nobel Award in Physiology and Medicine in 1944. He died in London in 1955.He was only interested in illnesses and how to cure them. William Shakespeare was born in 1564 in Stratford, in England. He married Anne Hathaway in 1582. He worked as an actor and a writer. Romeo and Juliet appeared in 1594 and Hamlet appeared in 1600. His plays were very successful. By 1610 he was very rich and he retired to Stratford. He died on 23 April 1916 when he was 52 years old. About four hundred years later, he is still very famous, millions of people all over the world read his works and see his plays in theatres or in cinemas or on television. Crossways is a quiet town. Crossways is a sleepy town. The people wear black hats. The women wear round black hats. The men wear tall black hats. The girls wear square black hats and the boys wear flat black hats. 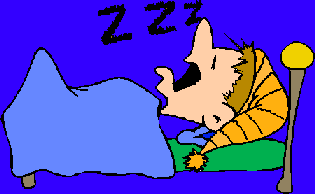 In the afternoon the people are sleeping and suddenly they listen to a loud noise. A small boy walks beating his drum. He walks in front of a donkey. The donkey pulls a cart. A man is sitting on the cart. Above his head there is a notice. It says “haircut in all styles and colours, one dollar”. The people shout and cheer. They throw their hats into the air. The small boy picks up all the hats and he puts them into a large bag. A young man climbs up the cart and the barber cuts his hair. Now the hair of the women is blue. The men’s hair is green. The girls’ hair is red and the boys’ hair is yellow. But next day everybody is bald! They are very angry. They want back their hats. They need and miss their black hats. Then, a young boy appears in the town. He blows a trumpet and a donkey pulls a cart full of hats. A man is sitting on the cart. He sells hats for only two dollars. The hats are all shapes and sizes. The people buy their own hats and they are happy again. All around us is plenty of moments. A moment is a short time in our life. There are thousands of different moments in our life. It is impossible to remember all our moments. But if we just write an adjective before a moment. We can name a specific moment of our life. Mike and Sulley are good friends. They are roommates. 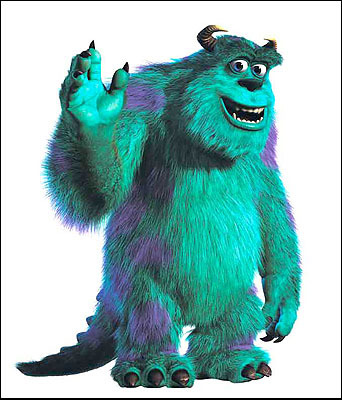 Sulley is an impressive built blue monster with purple spots. He is the first scarer at Monsters Inc. He is a nice monster. Mike is a green ball monster with only one eye. He is Sulley's best friend. Mike isn't red. Mike is tremendously proud and he isn't a receptionist. Mike loves Celia. Celia is the receptionist at Monsters Inc. She is sweet, and beautiful with snakes for hair and she loves Mike. Boo is a little human girl. She is adorable. She isn't a monster. She is a vivacious little girl. Boo isn't tall with snakes for hair. Randall is a lizard-shaped monster with eight arms and eight legs and sharp teeth. 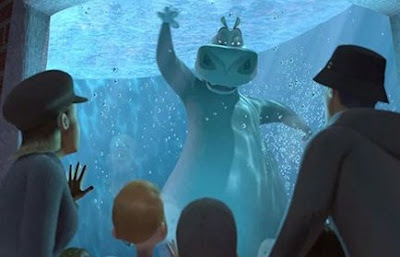 He is the second best scarer at Monsters Inc.
Waternoose is a large crab monster and he is the Grandfather of the company. He is a multiple eyes monster. Roz is a controller monster. She controls the workers with scarer reports. She isn’t a large crab. She is old with a big mouth. Cafe Colombo is always busy. The people drink coffee, read a newspaper and talk. In cafe Colombo everybody are well-dressed but Charlie isn't. He has a work. He is a shoeshine and he sits on the pavement. he doesn't go to school. A man shouts to Charlie, his shoes are dirty. Charlie shines his shoes . The man gives to Charlie a coin of ten cents. Charlie sits on the pavement again. He sees a man with a large notice along the street. The man sells lottery tickets. A well-dressed man buys a ticket, he takes a taxi but his ticket blows in the air. Charlie picks up the ticket and he waves his arms and shouts but the man doesn't hear. Charlie goes home and he shows the ticket to his mother. Charlie goes to sleep and he has a dream. He dreams that a goat eats the ticket. He wakes up and the ticket isn't in his box. Carlie goes to the lottery office,his mother is there. A man tells the numbers. a.- They are Charlie's numbers. Now Charlie and his family are happy and rich. b.- Finally, the lucky number is number 5, but Carlie has number 6. They are poor but they are happy. Destination Moon is the first part of one of the few multi-book stories in the Tintin series, the other album is 'Explorers on the Moon' Destination Moon is an often humorous look into moon rocket technology. Professor Cuthbert Calculus builds a rocket ship which will fly to the moon. Tintin and Captain Haddock travel to where the Professor is making his rocket. Good evening. This is the weather forecast for tomorrow in Great Britain. In the north of Scotland it will be sunny. In the south of Scotland it will be partly cloudy. In the north of England it will be a thundery day. In the east it will be foggy and in the south east it will be a black day, but in the south west of England it will be a snowy day. Finally, in the north west of Wales it will be a heavy rain shower day and in the south east it will be a light mist day. Well, this is the weather forecast for tomorrow. I wish you a happy day and good evening. Lisa and Alice work in "Black and Sons" Company. Lisa works in the Accounts Department and Alice works in the Marketing Department. They want to go on holidays to Greece. They need the passport. They go to the Post Office to get it. They must fill in a form and have some photos. Alice has got her photos but Lisa hasn't got them. Lisa goes to the old bus station. There is a photo booth in there. Lisa goes into the photo booth. She puts her money in the machine and she waits for the photos. The photos come out in the slot but they aren't hers. It is a murder. She is afraid. She and Alice go to the police station. They show the pictures to the detective. The police want to catch the murderer. They have a plan. Lisa comes back to the old bus station. The police are there, too. Lisa goes to the photo booth and she sees a young handsome man with a snake ring on one hand and a bird tattoo on the other hand. He is the murderer. The police catch him. Lisa is safe. Lisa and Alice go on holiday and they have a fun time.